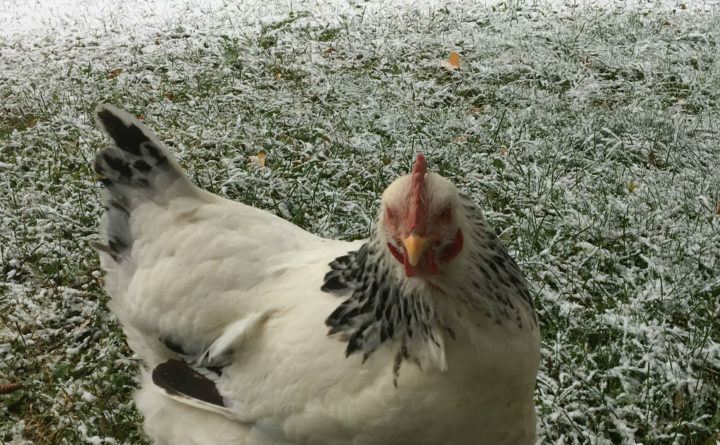 A chicken gets in one last stroll on the grass before the first snowfall of the season accumulates and covers it until next spring. Nothing, and I mean nothing, goads a homesteader or backyard poultry farmer into action faster than the season’s first forecast of snow. 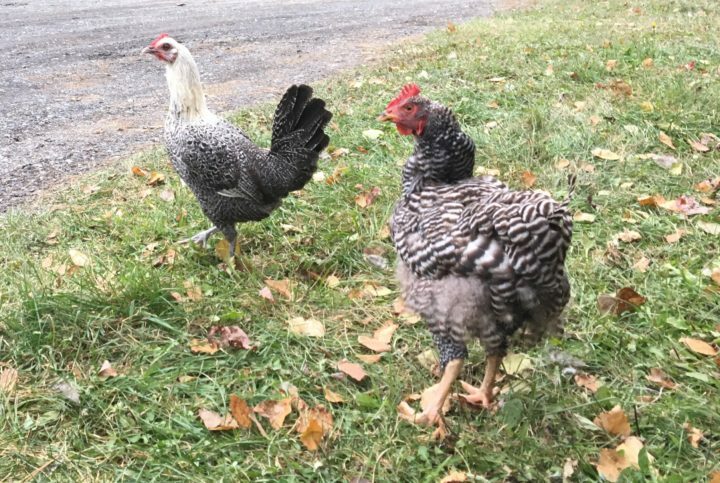 One minute you’re going along enjoying all the fall foliage colors, watching your hens scratch and peck at the new fallen leaves and collecting their eggs from the coop. Then, before you know it, you are staring winter straight in the face and feeling woefully ill-prepared for the coming onslaught. So what’s a chicken wrangler to do? Based on my own experiences watching the seasons change with my flock, here are some basics to get you and your birds ready for winter without losing your cool — or too many feathers — in the process. It goes without saying chickens need a warm, dry winter home. This means taking the time to insulate their coop and block any holes or cracks that can let in a draft. However, unlike our own homes, you don’t want to make the coop completely airtight. That is because a poorly ventilated chicken coop is actually more harmful to the birds than the cold. Without it, the air in an enclosed coop can become oversaturated with carbon dioxide, ammonia, and other gases and odors that make the space unpleasant at best and dangerous for the chickens at worst. In other words, don’t seal up the entire coop. For my flock, I insulated the ceiling and floor with standard Styrofoam insulation. I then used standard home foil-backed pink insulation in two of the four walls — and covered it with scrap lumber since chickens love few things more than pecking at exposed insulation. A third wall divides the coop from a shed in which I store straw, and I make sure to stack bales of straw against that wall as a winter insulator. The fourth wall I left alone as it is out of the wind and allows for a natural exchange of air throughout the winter. Every two weeks or so in the winter old straw should be cleaned out of the coop and nesting boxes and replaced with new, fresh bedding. To help them stay warm even on the coldest of Maine winter days, I install a poultry heat lamp that keeps the temperatures in the coop above zero. These are available from any farm supply stores or online from suppliers such as Premier 1. I use something called the Prima Heat Lamp, which is pretty sturdy and has a protective plastic grate over the bulb to prevent direct contact between straw bedding and the bulb in the unlikely event the lamp falls to the ground. All winter I keep a 250-watt red bulb going in the lamp. And yes, some days I think the chickens are in there tanning under its light, but the added artificial “daylight” it provides keeps my gals laying all winter, assuring I can have my traditional fresh Eggs Benedict on Christmas morning. If you don’t want or need to keep the heat lamp on 24/7 but still want eggs, you can place the lamp on a timer to ensure the hens get at least 15-hours of light a day, the minimum needed to keep them laying all winter. Not that I’m one to procrastinate, but let’s just say that there was a flurry of activity on my part when I had to troubleshoot and repair the electrical issue that was preventing the heat lamp from turning on. Even in a coop heated with a lamp, temperatures can drop below freezing, so if you don’t want to be changing out containers of frozen water for freshwater twice a day, a heated waterer is your best friend on the coldest of days. These can be purchased from farm supply stores or, if you are feeling crafty, a heater can be made at home by placing a string of Christmas lights inside an empty cookie tin and setting the waterer on top. The warmth from the lights will keep the water thawed. I also like to supplement the water with moisture-laden food during the winter and will toss in some apples, pears, grapes or other fruit for the chickens to snack upon several times a week. Given that the chickens are going to be cooped up in their coop for the better part of the winter, it’s important to keep their living space as clean as possible. 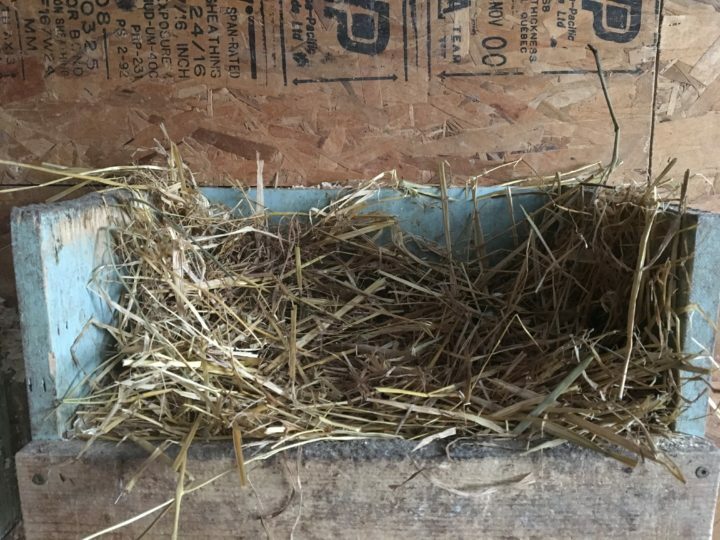 At the first sign of snow this past week, I thoroughly cleaned out their coop and replaced the old bedding with a thick layer wood chips topped with a thick layer of straw. For bedding, straw is a far better choice than hay as it is hollow and holds air, giving it a higher insulating value. I try to clean and change the bedding at least once a month during the winter. Granted, it’s not my favorite winter pastime, but the chickens really enjoy the fresh bedding. Remember, if it smells nasty in there to you when you go to collect eggs, it’s probably feeling a bit rank to the chickens as well. No, the chicken on the right was not the victim of an attack, nor is it ill. It is simply molting -- the natural state of shedding old feathers and regrowing new ones. Where did those feathers come from? As the days get shorter and nights get colder, there is a good possibility you will open the coop door one morning and discover its floor covered with feathers. No, this is not a scene from CSI: Barnyard. Your chickens have started to molt — the natural shedding of old feathers and regrowth of new ones. During molt your chickens are going to need some extra protein in addition to their regular feed. Daily snacks of cat food, canned tuna in water, meat scraps or mealworms will do the trick. Winter feeding also means they are going to need about one and a half times more food than they eat in the summer, and more carbohydrates. Supplementing commercial feed not only gets them those carbs, but wow, do they ever enjoy the variety as well. Depending on how much time and effort you want to put into this — and I am one who puts a lot into keeping the flock happy — you can simply toss in a few handfuls of cracked corn in the evening for a bedtime snack, or you can cook up a batch of oatmeal for a warm, carbo-loaded meal. Heck, if you want to make them extra happy, add some sliced bananas and maple syrup to the oatmeal before serving. You’ve heard the expression “rare as hens’ teeth?” That’s because chickens have no teeth and collect “grit” by scratching on the ground and eating it. This grit helps them break down and grind their food during digestion. In the winter you can supplement the grit in commercial food by tossing a couple handfuls of crushed oyster shells into the coop every two weeks or so. Finally, in addition to spending time on their menus, I spend a great deal of time making sure my chickens are not bored in the winter, since their days of free ranging around the farm end with the first accumulation of snow. Luckily, I have a three-sided shed with a dirt floor connected by an enclosed breezeway to the coop. On sunny winter days I will let the chickens out to into that shed where they can run around and have a dust bath or simply soak up the sun. Inside the coop there are a few things you can do to keep them stimulated. Placing an old mirror seems to entertain them as they watch their reflections. Old chairs or ladders placed around in the coop give them something to climb on and a head of lettuce or cabbage suspended from the ceiling makes for a great game of edible tetherball. So, here we are at the start of another Maine winter. Chickens tucked in, winter supply of food stored away and enough straw and wood chips on hand to keep things fresh and clean. Between now and spring, if you need me I will be here by the wood fire, researching chicken-friendly snack recipes.